I've just been doing a little hand stitching. I'm about to stop and go get my bike out for a little ride around the neighbourhood. I got supper out of the way at noon time, a chickpea loaf. I cooked the chickpeas yesterday. Today, I pulsed them slightly before putting them in a bowl. I tend to make things on the fly. Of course the basic idea usually comes from browsing the net. 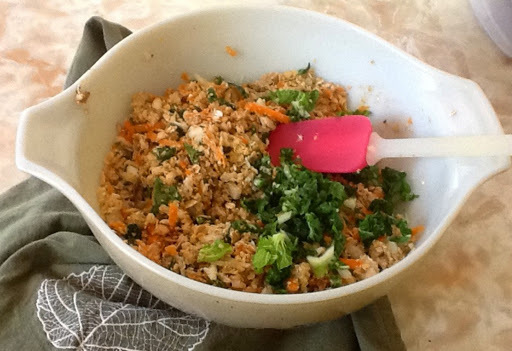 I added oatmeal, homemade breadcrumbs, greens, grated carrot and parsnip, some seasoning, an egg plus an egg white. It gets mixed and pressed into a pan. It's baking right now for an hour at 300F. Finally, the sun came out today! It's not seasonably warm yet but at least the rain has stopped. I went outside and potted up some lettuce seedlings and then prepped a small area of vegetable garden. Still have to keep everything in at night though. When I sat down for tea this afternoon, I pulled out my silk ribbons and perle cottons. I just want to add a few touches the Moonlight Garden. After meeting friends for coffee and getting some housework done this morning, I got down to work on my latest piece. I think I may call it Moonlit Garden. I added a piece of lace on the left to balance out the bits of white. I plan to add some hand stitched details with the fibres pictured on top. 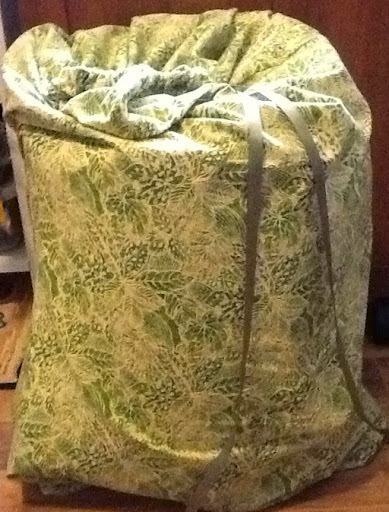 I've done 3/4 of the quilting done in a variegated green. For the final bits, I'm switching to a variegated pink. I worked an hour today and then went for a walk. Now, I'm going to grab a tea and see if I can finish the binding on my brother's quilt. I'm nearly there. I couldn't wait today to get back in my studio to the piece I put together yesterday. I wanted the leaves to pop out more so I decided to experiment with pastels which I rubbed on. Since they're chalky, I knew something would need to go over it for stability. I tried brushing on matte medium. It works but deepens the color. 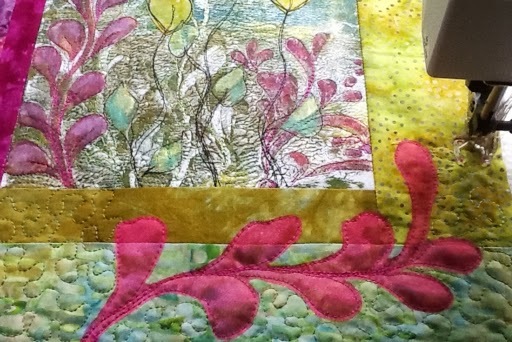 In the picture below I've added it to the pink vine and the leaves on the stems below the appliqués leaves. I then ended up adding a lighter metallic paint for a highlight. Next, I wanted to try adding a shear overlay. Of course I didn't practice on a sample. I jumped right in, drawing up my design and using a chalk pencil to trace it onto the organza. I pinned in atop of the now sandwiched quilt top and free motion stitched it down. I don't have any special appliqué scissors so would you believe I used little cuticle scissors? They have a nice little curve. I've started stippling the background and I did back and forth curves in around the foliage in the centre. I'm not sure how I'll do the rest yet. I spent my afternoon at the shop today. It was cold and rainy, so a good place to be other than the studio. 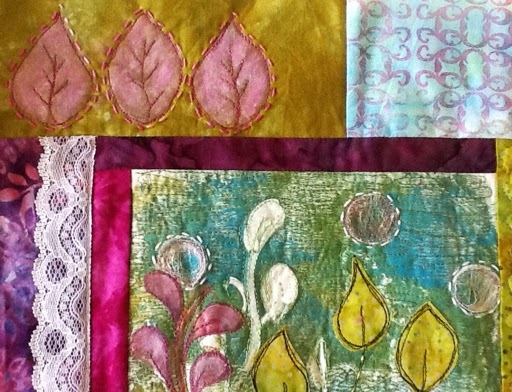 I even sold a small art quilt today, my second in a couple of weeks. What a nice feeling! After a rest, tonight, I felt like doing a little something. 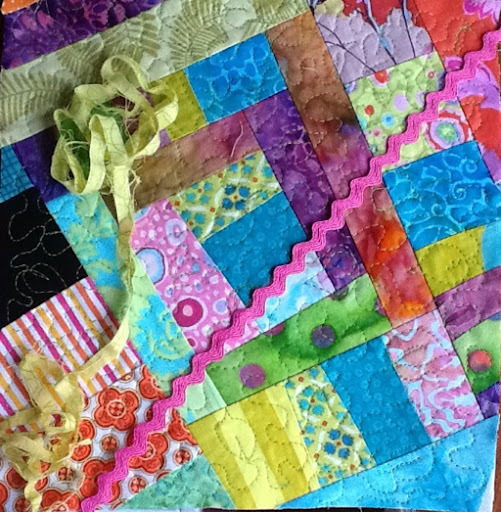 Rather than putting more rows on my quilt, I started adding some border fabrics to one of the Gelli prints. It's getting dark, so not the best picture. This is one of the prints that I've been moving around on the design wall and it just wasn't clicking for me. Tonight, I grabbed it and started pulling out fabrics to add to it. I think I like where it's going so far. It will need more paint, stamping and stitching. I bought a bunch of sheers when I was away that I'm itching to try too. We shall see. As promised, I've got a slightly improved photo of my quilt with one more row added. 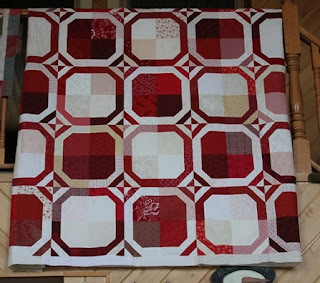 The blocks finish at 12 inches, so I'll be using the cornerstone fabric to make at least one more border after the black. At the camp there is a small loft area where we like to hang finished pieces. 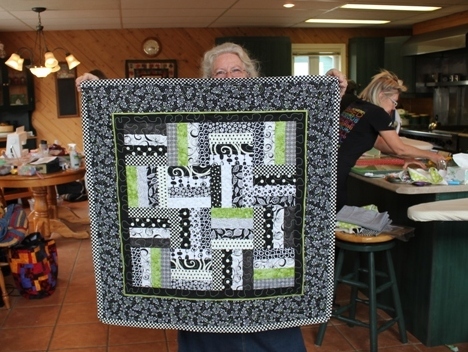 Two of the quilters, Sue and Wendy were working on Shnibbles. Did I even spell that right and does anyone else know what they are? I know the designer comes out with one a month, I think, and that most are table topper size. 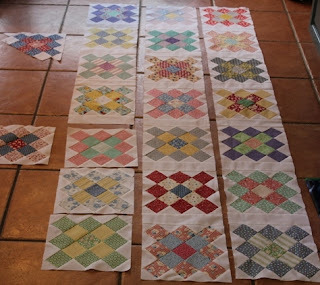 Paula started out with plans for a granny square baby quilt with repros and then decided not to stop. It going to be a really pretty quilt. Two quilts were brought for show, a scrappy one done by Anne. And this red and white beauty by Sue. 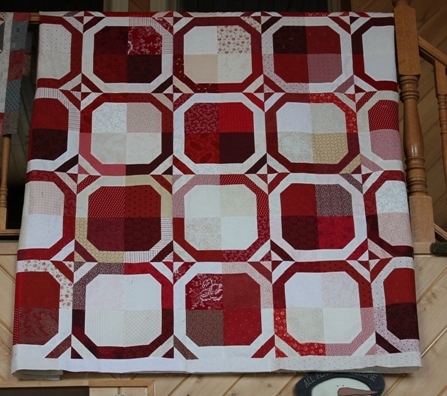 It's called Scarlet Queen by Miss Rosie's Quilt Company. Here's another show and tell by Wendy. She only had to add the binding. I love the black and white with the chartreuse color! It takes us about an hour to drive to this camp, 3/4 of it being on a dirt road. Once there, we're sewing in about a half hour. Well, except for Wendy who brings most of her sewing room and who takes a little longer to settle! We bring all our meals prepared ahead of time so we just warm them up and then it all goes in the dishwasher. Can you believe it, a camp way out in the woods with a dishwasher! We stay one night and have 2 days of fun.It's amazing that it only takes about 1/2 hour for us to clean and pack up. We're a good team. We like to sew until the last minute and then we whip into action. I'm back from our two day retreat. I've eaten, soaked and mostly unpacked. There were seven of us and as usual, we had fun, ate lots of good food and sewed all day and half the night. Well OK, I made it to nearly 10 PM, a first for me, I think. 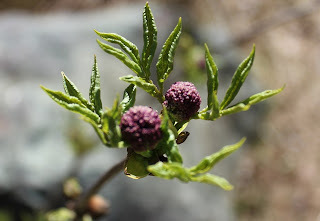 I took a couple of pictures on my camera which I haven't uploaded yet. The following is a rather grainy I Pad pic that I just took as it was getting dark. 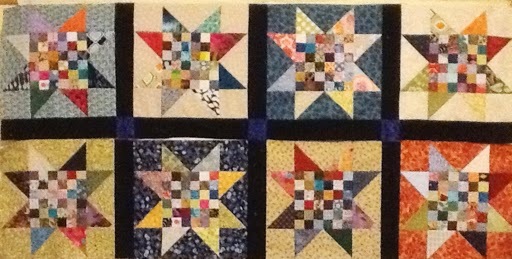 I finished my 20 squares, (enough for me) with the postage stamp centered stars. The sashing and narrow border will be all in black. 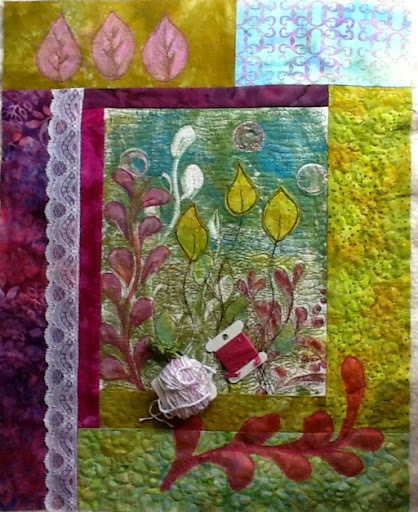 I have another border which I believe I will add a few flying geese to and I think that'll be it. Since our guild sewing days and retreats are over until the fall, I think I will take the time to finish this quilt up in between doing bits of artwork. 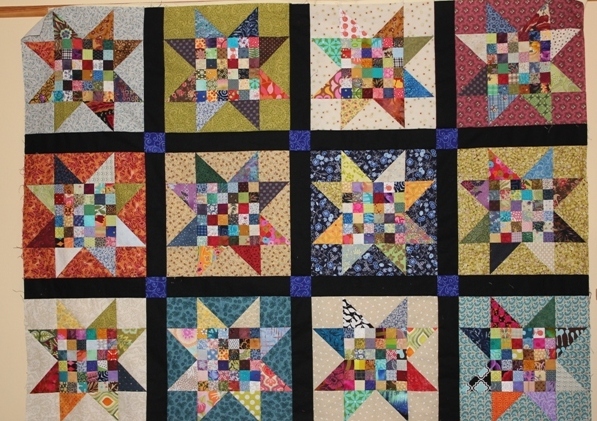 I once read a blogger who coined the phrase 'schizophrenic quilter' and i think it would be apt for me. So, hopefully you won't mind seeing a bit of a mix in the next little while. I promise to get a better picture once I've got the rows together too. Despite the holiday here in Canada, my husband had to work. 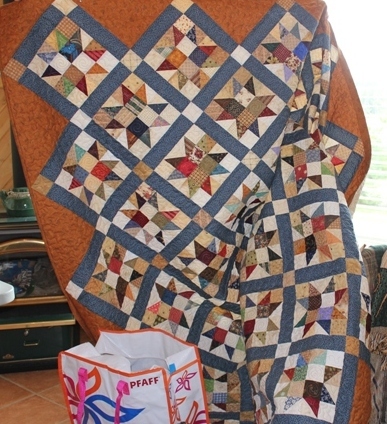 It's been mostly a cool damp day anyway and I had some packing and food making to do for my quilt retreat tomorrow. I'll be away for a couple of days. I did get out for a walk before the rain started. 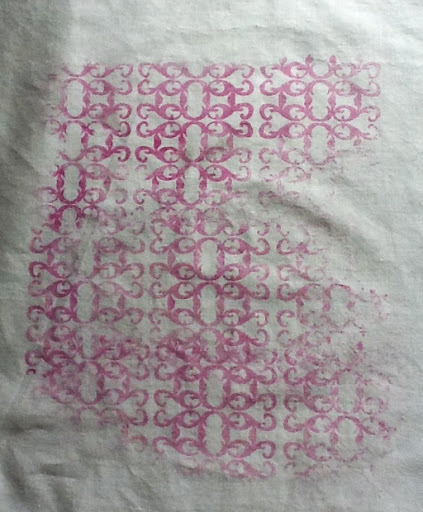 In between washing clothes and getting ready, I pulled out some fabrics and my Neocolor II crayons to experiment with one of the Gelli prints. I'm not in love with it but that is part of the fun of experimenting. One never knows how it will end. Perhaps I'll do some stitching on it or perhaps it will get cut up and added to something else. Despite the ongoing cooler than normal temperatures, I went with my husband to the golf course to have a bit of a practice. He was golfing yesterday but so far this year, I've only been out hitting a few balls. Hopefully it'll be warmer by next weekend. On Friday night we went to see Ironman 3. I really wanted to see The Great Gatsby although i love the Ironman movies. We opted for the earlier movie. I really enjoyed it, especially in 3D, but wow, it's getting expensive! 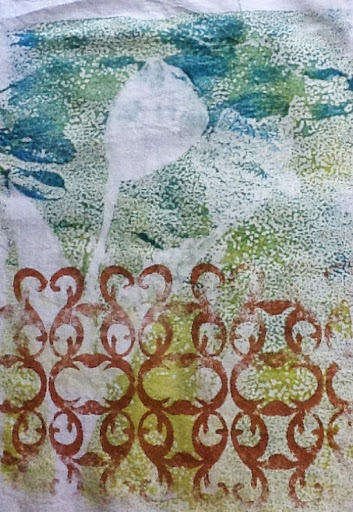 This afternoon, when I got home, I felt like trying out a couple of Gelli prints. I was inclined at first to think the first one didn't work well. The 'fence' is too prominent. However, I think it can easily be rescued with some paint and appliqué. It's always fun to play and see what develops. The second one turned out OK. It's busy but that was kind of the idea. Emphasis can be put on certain elements with the use of stitch, overlays, or Paintsticks. That's the fun of these. I have sort of an idea of what I want when I start. Quite often I end up in a completely different place. The only other thing I feel about the second one is that I would like to have some lighter colors to choose from. 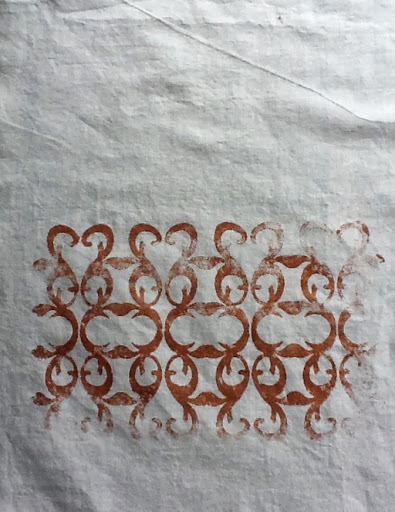 I do have a white; however, it is opaque and I was using transparent paints. I didn't want to cover up too much of yesterday's screens. I certainly could have with the first one. Little by little I'm getting packed for retreat. After doing my watercolor of the tulips yesterday though I got an idea and had to try it out. This is purely experimental. I started with white cotton, some Setacolor opaque paint and some matte medium along with the screens I had made. The first one is white on white and is only showing up because I taped it to the window. 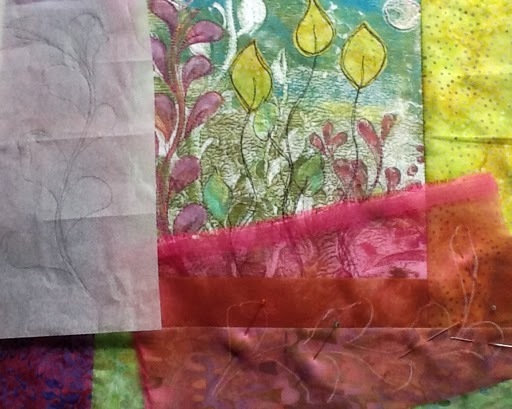 The plan is to layer transparent paints over top using my Gelli. You'll have to stay tuned to see how it turns out. The next one is also intended as background texture to be layered with more paint. We'll see what happens. 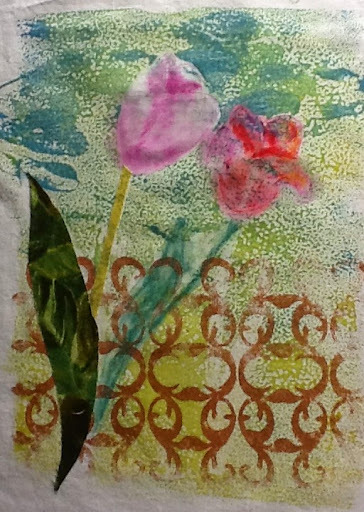 Of course I could print with the Gelli and screen print on top but I think this will give a different look. The last one was done with a bronze color which doesn't show well. Maybe I put it on two thickly to be layered. We shall see. Sometimes the results aren't always expected but will work out anyway. That's the fun part. 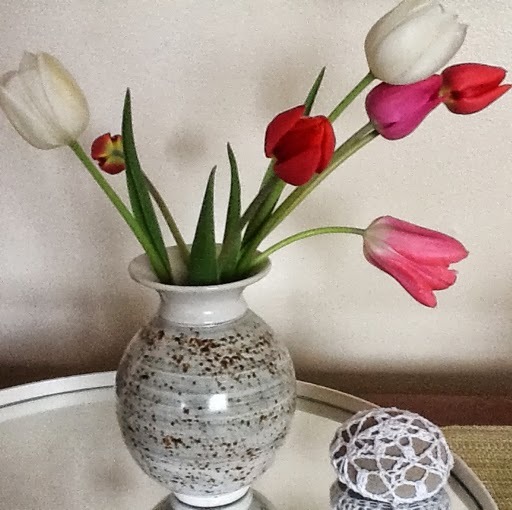 It is my habit to do the odd sketch of whatever is in season and the tulips that i picked yesterday are the first flowers of spring from my own garden. They will make a good reference for the textile work that I do. Thinking that I might like a textural layer underneath, last night I screen printed my motif design onto my sketchbook page using acrylic matte medium. The pages are only a thin paper, hence the rippling. I don't mind though. 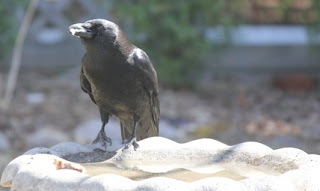 I'm just recording bits of my garden and a few thoughts; it's no masterpiece. But, it gives me ideas to ponder for further work on fabric. Once that dried, I added a pale layer of watercolor ( the gold color). Today, I penciled in the sketch and added watercolor to it. Then I outlined with black pen. 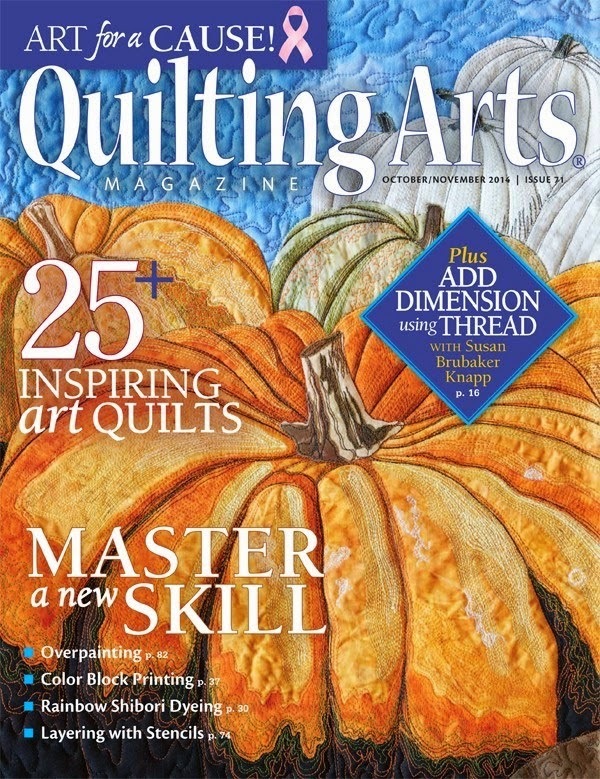 Now, I'm just about to gather my quilt around me and get stitching. It is unseasonably cold here! Happy Victoria Day weekend to all my Canadian readers! I got the binding on my brother's quilt and I've just started the hand sewing part. 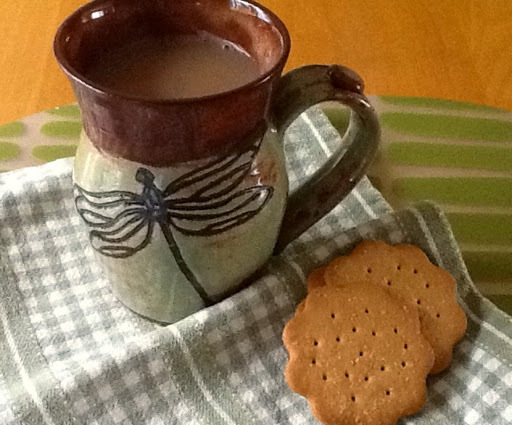 I find it relaxing and perfect for a damp rainy day such as today. I've been a little indulgent today, nothing extreme, just a couple of small things that lift the spirit. First, I went to lunch with a friend and then we went to the local craft shop where I have my things and we bought matching pottery mugs. I'm sipping my tea in it right now. Funny how some wouldn't care what they drink from, but a special mug gives others such pleasure. It must be the artist's soul. When I got home, I went out and cut a few tulips. They're from my backyard where they can only be seen if I'm out there which its too cool for anyway. I've been making lists and getting things ready for our retreat next week too. I made a bag to hold the memory foam pad I take with me. I have sleep issues and it makes a difference for me. Last year. I bought one of those double high twin air mattresses and with the foam on top, it's perfect. I'm recuperating from my travels yesterday and catching up on a few household chores today. 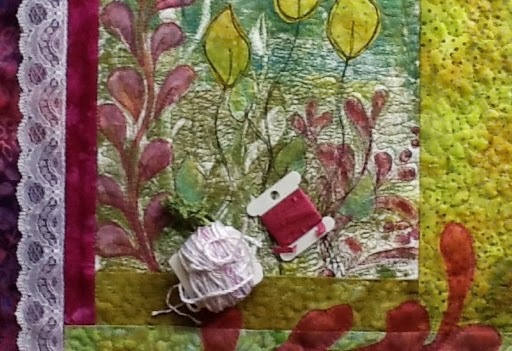 My task for this afternoon was to get out for a walk and to make the binding for a quilt that I just had machine quilted. It's for my brother and sister in law. There is a possibility that they might be here for a visit this weekend, so I'm aiming to get the binding done just in case. 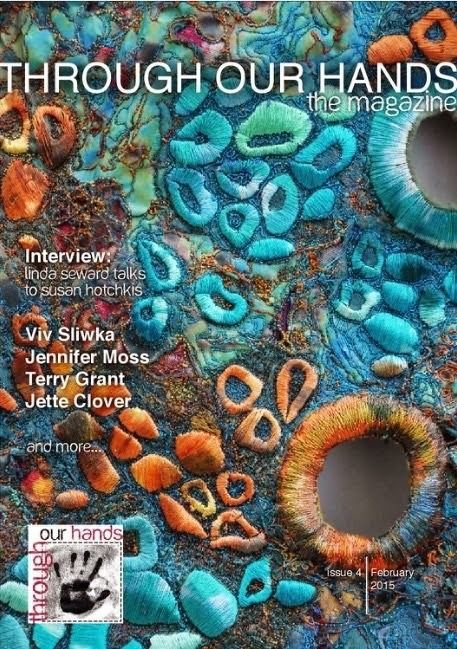 For the next couple of weeks, I may not do any fiber art work. Once I'm done the binding, I'll be starting to pack for a quilt retreat next Tuesday and Wednesday that we do every year at a friend's camp. 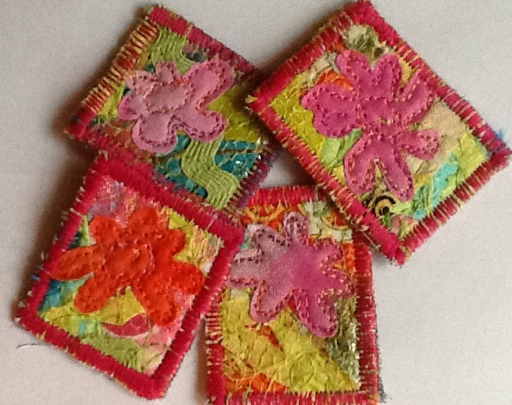 I plan to work on my postage stamp quilt. 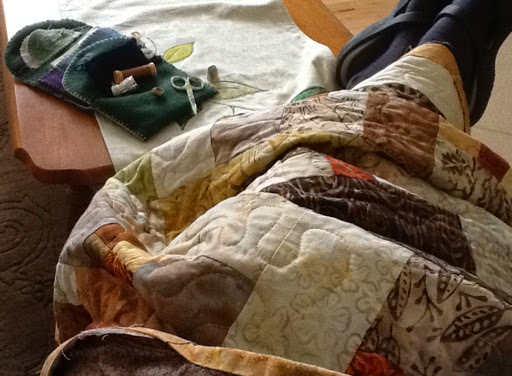 It's easier to bring a quilt to work on than supplies for fiber art. I never know what I might need when I'm doing fiber art. There'd be too much to pack and I'd inevitably miss something. Today has been a quiet day but sometimes those are the best. My husband made breakfast and we relaxed over the paper. He reads; I do the crossword. Then we went for a walk and after lunch we went to his parents for a visit. I didn't really have time to get into much, so I cleaned up my sewing space a bit and cut scraps up into various sized squares. Do you do that? I have a box full. I wonder if I'll ever use them. Yesterday, was rainy so I went down to the craft shop and put in my few hours there. My things are arranged on shelves. I didn't get the best picture, partly due to a window on the other side. Tomorrow were travelling out of town for my yearly doctor's appointment with the endocrinologist. It's about a two hour drive each way and I have a big list of shopping to do as well, so we'll be busy and tired tomorrow night. I don't have much to blog about as I spent yesterday organizing my things to take to the shop downtown. This morning I dropped it all off and I may get a picture of it in situ tomorrow. I've been out most of today. To-night I've taken a few minutes to finish the edge on these small brooches. Besides having little time to spend in the sewing studio, I've really been dragging. I did have all my blood tests this week though, and will see my endocrinologist on Monday. I have to travel out of town, but the good news is that I'll get to do a but of shopping. I've made a list. I've been dragging myself around in a stupor all day and I'm finally giving in. Between allergies and restless legs, probably due to my extra spring time activities, I was up half the night. This morning,I did a few chores, throwing out an overgrown spider plant and potting up the baby. I cleaned a couple of windows so I could put the screens on and open them. After lunch, I added the final bits to a brooch and a bookmark that I want to send out in a gift tomorrow. I had to push myself to finish the quilting and sew the binding onto the little tulip piece but I had to quit without hand sewing it to the back. As i write this I'm snacking on a bowl of watermelon and cottage cheese. Really, it's one of my favourite things! I've put my feet up until its time to start supper. I got my housework done this morning and met some friends for coffee. At noon I baked a spelt oatmeal crust for a cauliflower ricotta pie that is now baking in the oven for supper. I also went to a doctor's appointment so I had only a snippet of time for sewing. I managed to cut out and stitch down flowers on all the rest of the brooches and a bookmark. 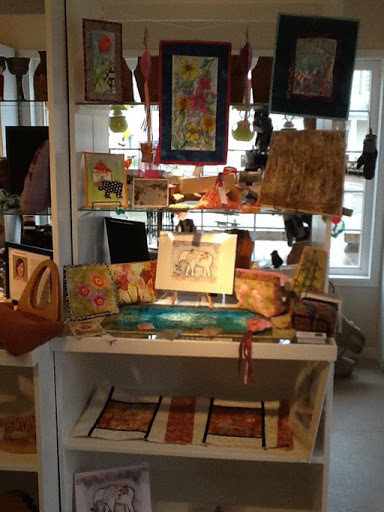 I'm getting my things ready to take to our local craft shop, Chal Baie, located at our waterfront downtown. Then I pulled out one of the tulips that I painted and bordered a couple of weeks ago. 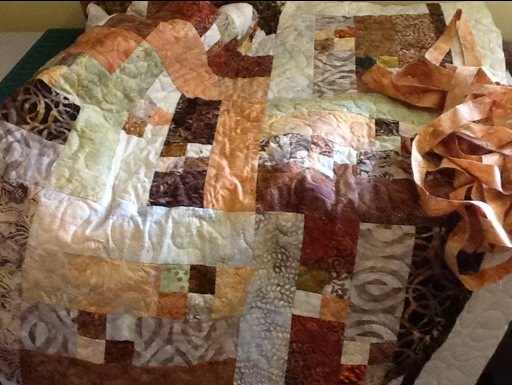 Last night I added a bit from one of my new screens and I decided to start quilting it today. 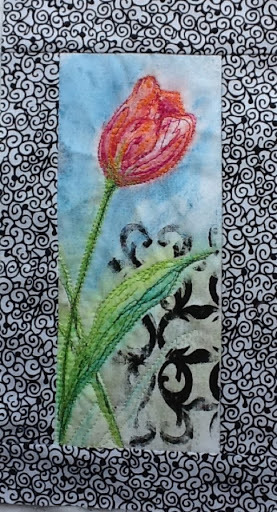 I stitched all around the tulip and the leaves and the tulip really stands out although I don't think that shows up in the photo. 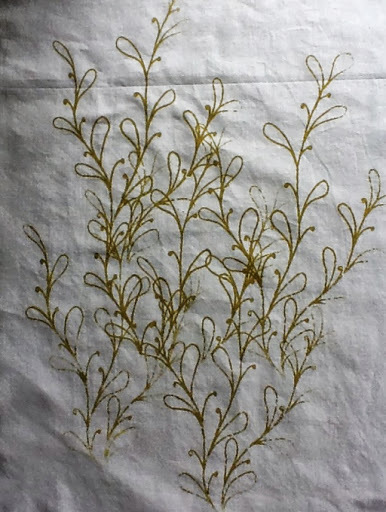 I will stipple the narrow border and I have a lively fabric in mind for the binding. 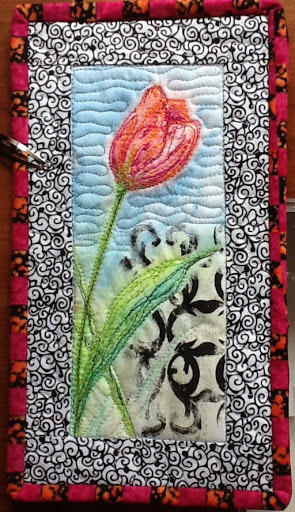 I can't decide if I should quilt around the tulip too. After lunch I sat on the deck with my cup of tea in my new lounge chair and finished a book I was reading. 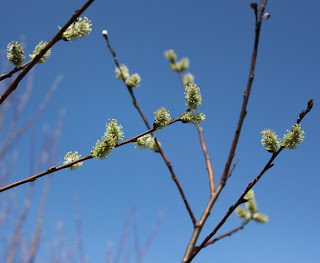 Then I took my camera along on my first little bike ride of the season, looking for some signs of spring. It was hot enough that I didn't need my jacket, but the forest floor is still strewn with dried leaves and the trail was covered here and there with snow. There is not much spring green to be seen yet, but I did spy a few buds getting ready to burst on some small bushes. 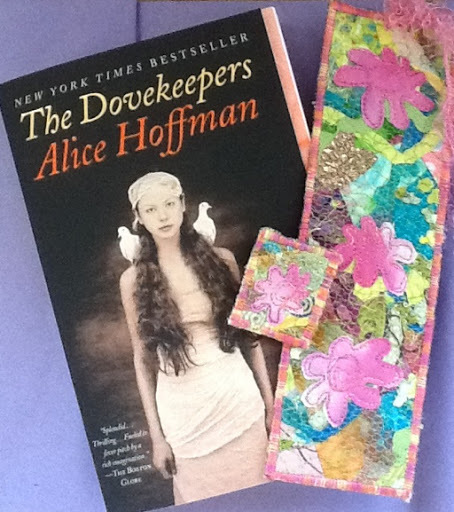 I also took a bit of time to finish another bookmark and one little brooch. I have several brooches cut and one more bookmark and it would for sure be quicker to do a bunch in an assembly line fashion; however, I want to add one of these to a gift that needs to be mailed. We also have another raven visiting and dunking it's food in the bird bath. I do get a kick out of watching them.! I'm heading out the door shortly but I just had to take a little time for some stress relief in my studio. I pulled out my basket of leftover fibres that I collect from past projects. They are loosely bagged by color family. I save everything! 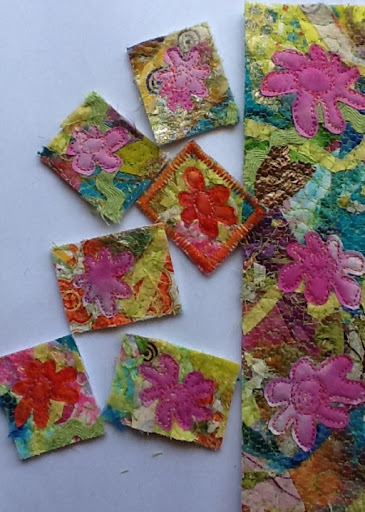 Little bits of lace, scraps of Angelina fibres, bits of thread and yarns, strips of fabric left from straightening an edge, even foil candy wrappers! I started layering them all onto my crazy patch that I did last night. I guess I didn't need to do that free motion layer, but oh well, it was fun! Next I cut and laid a piece of tulle netting over the whole thing and added a closely sewn layer of meandering to hold it all down. 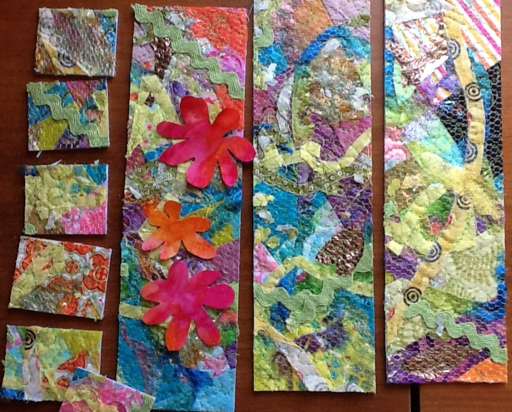 I've cut it up into book mark sizes, adding fusible flowers to see how it will look. Hmm, I'm wondering if I can fuse with a low iron onto the netting. I'll stitch them down anyway. I'm even going to use the little bits for brooches! I've got to leave it for today. I'm off for my errands and tutoring. Sometimes when I'm a bit stressed, which I am at the moment, (some family health issues), I can't seem to settle into serious art making. I did manage to order some new business cards from Vista prints though. It's amazing how much time that sucked up! I went for a walk, always a priority, and then did a bit of sewing before supper. 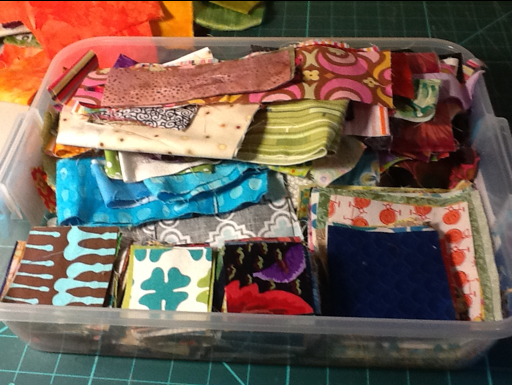 I grabbed a piece of Timtex and my box of scraps and started sewing crazy patch style. Then I did an all over free motion leaf. The plan is to add flowers and texture and cut it up into book marks. I'm not sure if the Timtex is too thick or not. I've tried other things and found them flimsy so we'll see. Tomorrow, I'll be out for errands, lunch, and tutoring and may not have time to sew. I was restless tonight and so decided to do quick sketches of the tulips I picked up at the grocers yesterday. They were free, in consolation for them being wrongly priced. Isn't that great!? The photo is not the best as it is just going on dusk here. Today was my swimming and tutoring day so I don't usually sew. I continue to move around the pieces of my garden puzzle though. 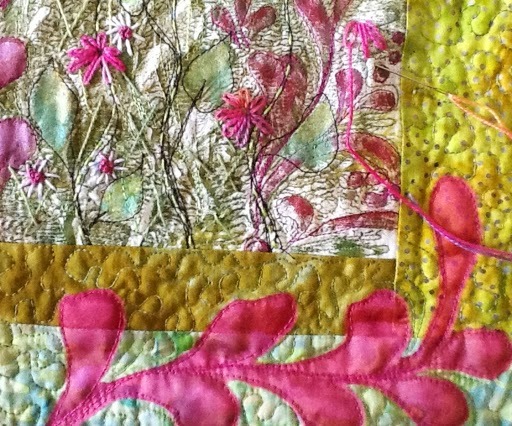 Before I left the house, I added a pale pink screen on the green fabric from yesterday and added it to the mix. It still isn't saying anything special to me. I think I like the longer version. Tomorrow I want to start putting some borders and blocks together. See if I can get anywhere with it. I'm looking at it on my screen and wondering about taking out the green strips. Too dull? This is a piece that is not flowing easily as some pieces do when one is in the zone. It is requiring some work. Hopefully, I'll get there in the end.